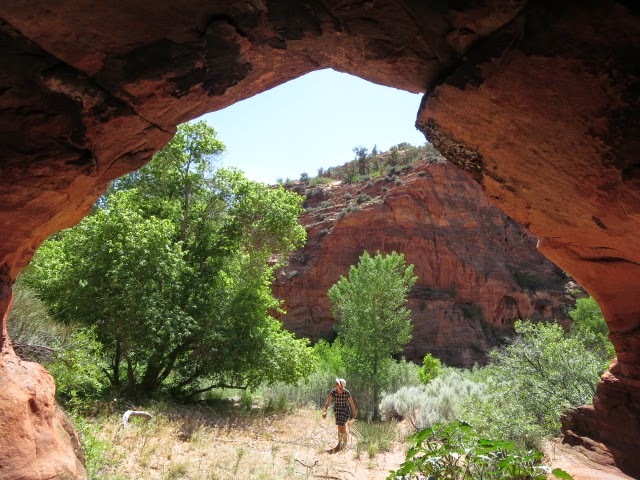 We hitched out of Kanab and chose to rejoin the Hayduke by hiking down another route down the Virgin River from Mt Carmel junction. 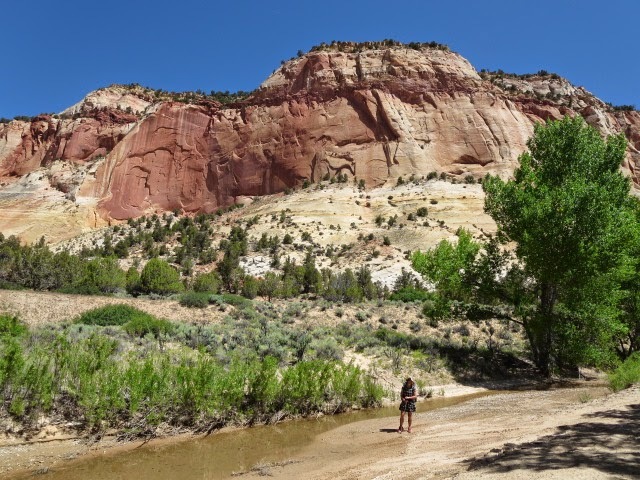 We started out down a jeep track following the river valley, half a mile south of the junction into an area called White Cliffs. The views out to these cliffs on either side of the wide valley were beautiful, the walking was easy for a while and the temperature today was refreshingly just warm. This was a lovely colourful hike with pink, red, yellow and white rock set against a clear blue sky. Heading west, we left the jeep track, sometimes to hike through the brush on either side of the river and sometimes finding it easier to hiking down the river itself. Dropping the rucksacks at the junction with Mineral Gulch, we explored this canyon to the north which was a worthwhile trip up a narrow steep walled canyon of Navajo Sandstone with some deep caves. 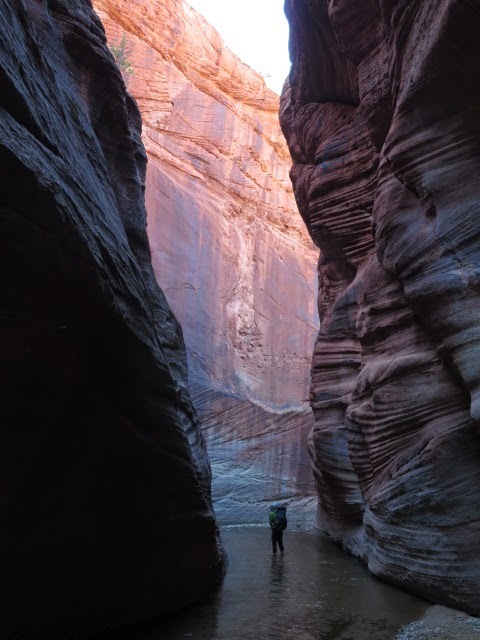 Back in the main river as the heat kicked in again, we collected the backpacks and hiked westwards as the canyon narrowed nicely with some big alcoves and deep red walls. 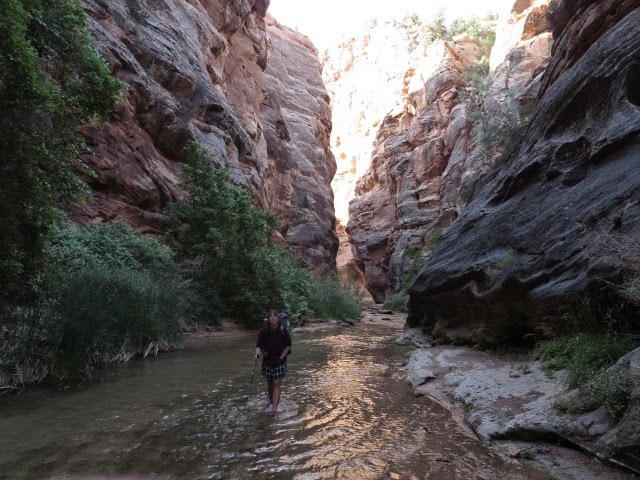 We passed Rock Canyon where the Hayduke joined our river from the south and hiked another 4.5 miles of grand deep canyon called the Barracks- but Parunuweap is the Payute Indian name. Much of the hiking was in the roaring waters of the river itself now with the steep walls restricting hiking on the side banks -but this was fantastic hiking. 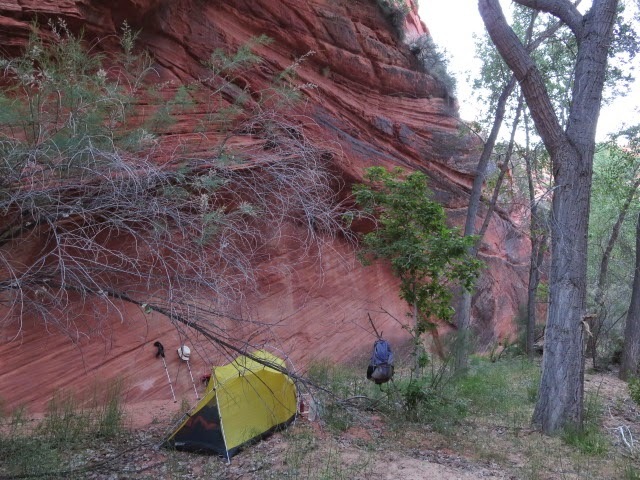 At about 18.30 we found a sandy bench to camp next to the river flanked by steep walls. We hoped for no flash floods in the night but the weather looked dry and stable overhead. 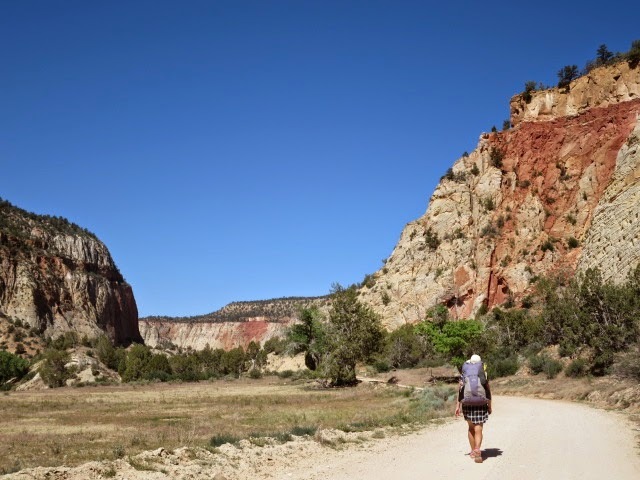 We were away from camp at 6.15 am splashing down the river between brilliant red steep canyon walls. As we progressed, the river got deeper and deeper, fed from many side springs such that we were thigh deep in water on occasions. After a couple of miles we reached a boulder jam where the river plunged noisily over into a deep pool. We avoided this obstacle by a climb up leftwards and then a subterranean descent down a chock stone chimney to exit below the blockage. Back in the river we continued more easily to the ‘Fat Man’s Misery’ junction and our exit of the canyon on the Hayduke route just beyond. 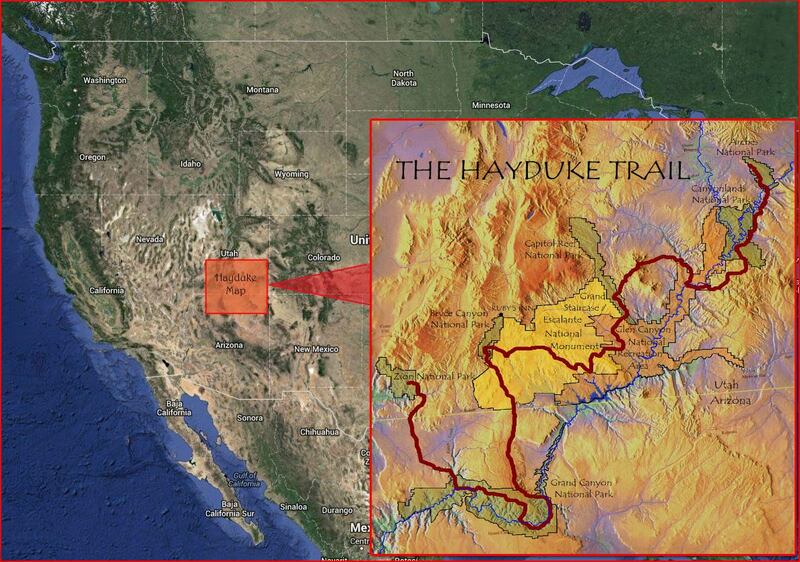 The Barracks had been a wonderful experience and we were so glad we were wrapping up our Hayduke hike in such magnificent, world class scenery. We still had 15 miles to go though, so we stopped to collect and treat some water, had some food and emptied our shoes of the gravel from so much river wading. 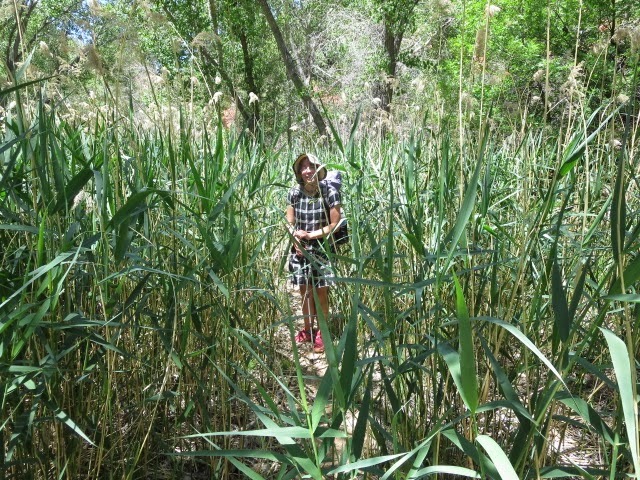 The exit climb was bushy and Martina spotted some poison ivy which we hoped that we avoided. But there were signs of use from other hikers as we scrabbled up through some scrub to exit onto more open slickrock slabs. With the odd cairn to help us we then continued onto easier faint trails on flatter ground as we heading north. 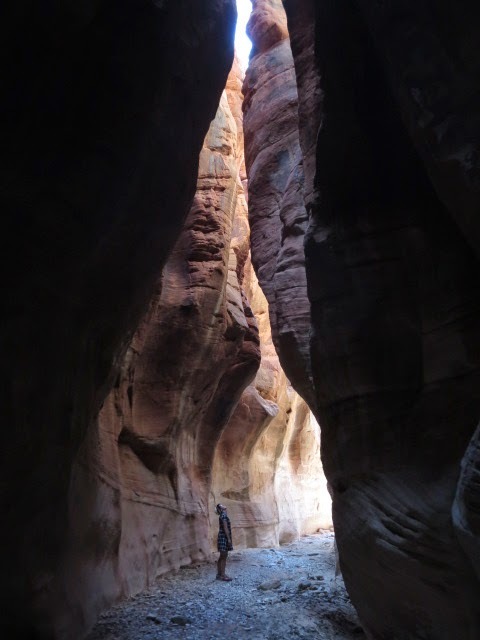 This was completely different to the deep canyon with red, gold and orange slick rock slabs on an undulating plateau and quite stunning in its own way. After skirting some mesas, we turned north to climb up a steep sided tree filled slot to a col. The views around here reminded us of Tuolumne Meadows in California and it had a great mountainous feel. Dropping down north through the slot like valley we passed by a couple of other parties of hikers before hitting the Zion National Park road. We headed on on good trail but the heat makes for hard going. Reaching Stave Spring we find that it is all but dry with just an intermittent drip every few seconds. 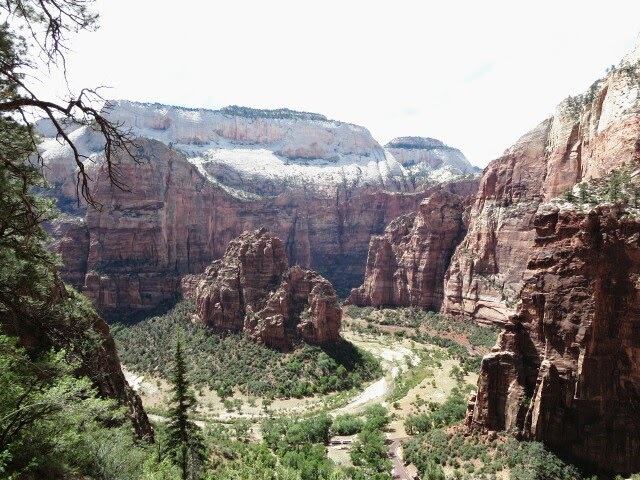 We had only 5 miles to hike though and soon drop into the scenic steep walled valleys that Zion is famous for. A 2,500 foot descent and we make it to our trail end and the road. 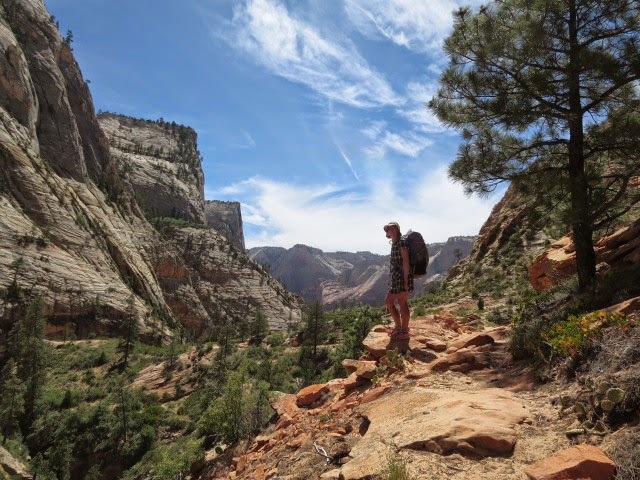 Sadly the horrid heat somewhat detracted from the splendor of Zion valley and we headed out by bus quickly to escape the furnace! We vowed to return some day to give the park the attention it deserves. 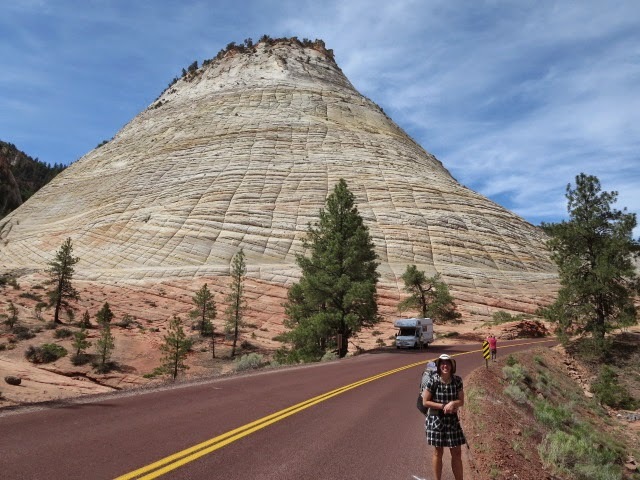 Despite the heat of our last couple of weeks in the Grand Canyon and Zion, what a fantastic hike we have had on our own version of the Hayduke. 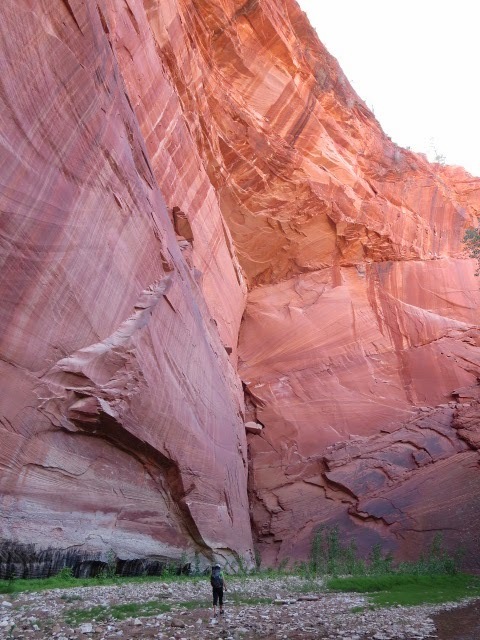 The mix of beautiful red rock canyons, riparian green waterways, dry desert plateau and high forests has won us over. 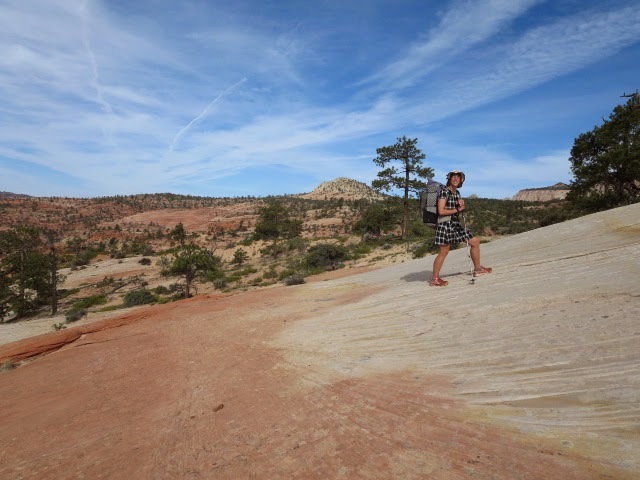 The variety and challenge of the terrain from scrambling through canyons and their sidewalls, wading rivers, hacking our way through scrub and enjoying some relaxing contrast of trails and jeep tracks was brilliant. Rather than being tired of this part of the world we are desperate to return!